Let’s meet at UC Day 2016 Conference in October! 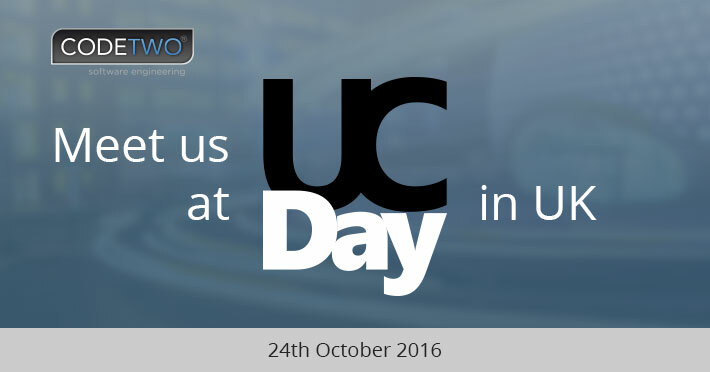 Let’s meet at UC Day 2016 in October! A second edition of UC and Cloud Day 2016 is just round the corner. This year, the conference takes place at Nation Conference Centre in Birmingham, on 24th October 2016. We are proud to participate in this event as a sponsor, so don’t forget to book your ticket now (it’s free) and stop by our booth to chat about our solutions for Office 365 and Exchange Server. Visit UC and Cloud Day 2016 Conference! One Day Microsoft UC and Cloud Conference is a great chance to meet and listen to recognized experts and MVPs, who will come there to share their wide and real life experience. During the conference day packed with informative sessions, attendees will be exposed to a tremendous dose of stories the experts gathered through the years of working with Office 365, Azure, Exchange, and other Microsoft-related platforms. We are convinced that this conference will bring a whole bunch of inspirational ideas to the world of Exchange and Office 365 and will help us to strengthen this valuable community. Get a gift from us! Don’t forget to pop by our booth – we would be happy to meet you in person! This is also a great opportunity to talk about our solutions for Exchange and Office 365 as our experts will be there waiting to answer any product-related questions you may have. Oh, and one more thing! We have a special gift for you, so make sure you don’t leave the conference without getting one. Let’s network at UC and Cloud Day 2016!